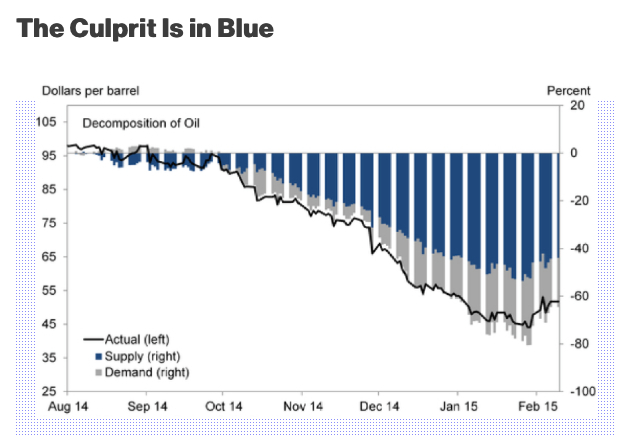 “Is supply what done it,” says Goldman Sachs (as reported by Bloomberg; click chart for larger image). Looks authoritative? And, on top of the pretty chart, Bloomberg tells us that Goldman is using a “vector autoregression with sign restrictions”. Yeah, right. Solid statistical (and thus econometric) forecasts need to be founded on known and stable relationships–we have neither (we rarely do in macro). 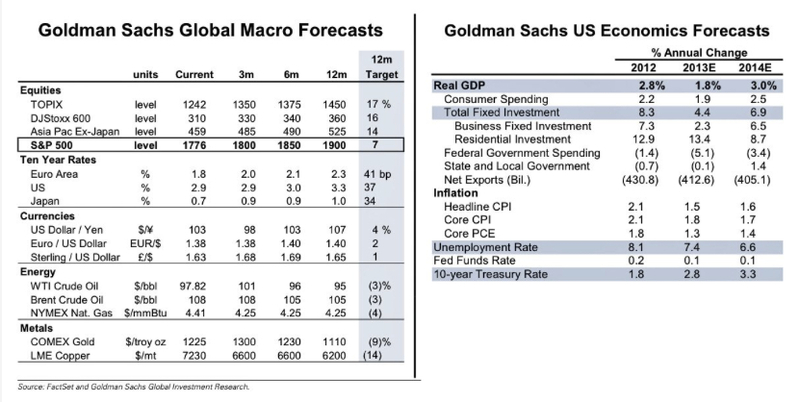 Supposedly, Goldman knows that if demand is X (holding supply stable), price will likely be Y. Or, if supply is W (holding demand stable), price will likely be Z. And then a dynamic multi-factor model can be created to bring everything together. Perhaps I am being too harsh. Goldman’s supply and demand decomposition does give us a cloudy window into past price movements, but it certainly won’t give us a reliable vision of the future. In reality, the prognostications of market strategists are a form of economic story telling. And the best story tellers get paid the most. In certain aspects, humanity has not come that far from 10,000 years ago. The stunning collapse in oil and metal prices since last summer (see yesterday’s post) has brought the cornucopians and abundantites crawling out of the wood work. From an (otherwise very good) article in The Economist of 17th January titled “Let there be light”. An increase in supply, a surprising resilience in production in troubled places such as Iraq and Libya, and the determination of Saudi Arabia and its Gulf allies not to sacrifice market share in the face of falling demand have led to a spectacular plunge in the oil price, which has fallen by half from its 2014 high. 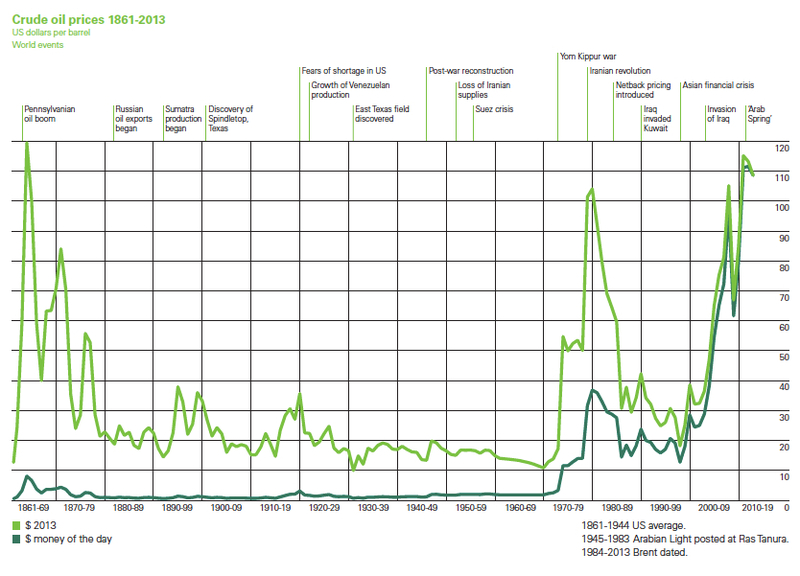 This has dealt a final blow to the notion of “peak oil”. There is no shortage of hydrocarbons in the Earth’s crust, and no sign that mankind is about to reach “peak technology” for extracting them. Frankly, this is just sloppy thinking from The Economist: the second sentence, which talks of a “final blow” to the notion of peak oil, doesn’t follow on from the first. In short, the paragraph muddles the short term and the long term. 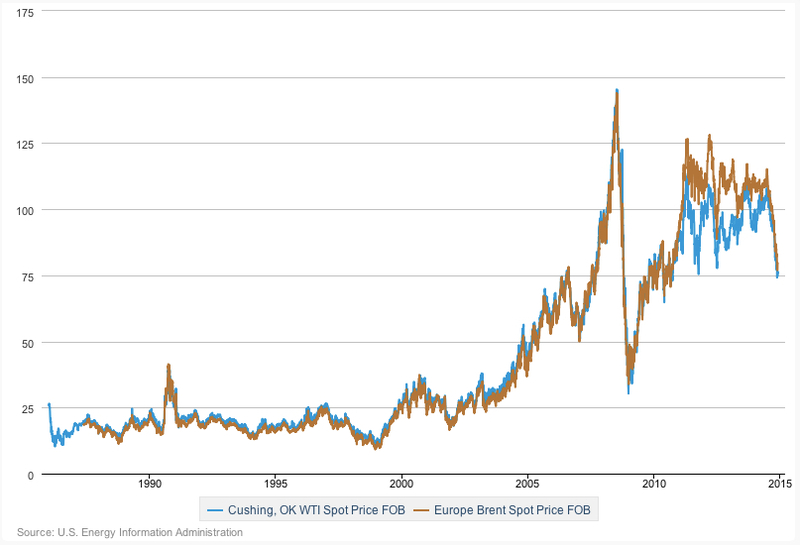 Why is a fall in oil prices barely six months’ old a “final blow” to the notion of peak oil? 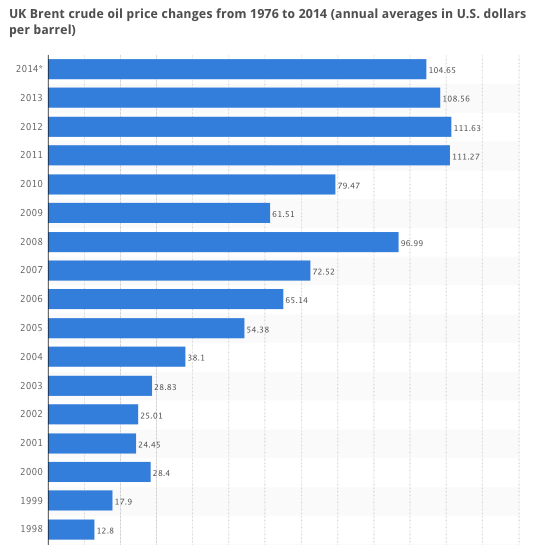 And while fracking shows we are far from “peak technology”, it says nothing about price. 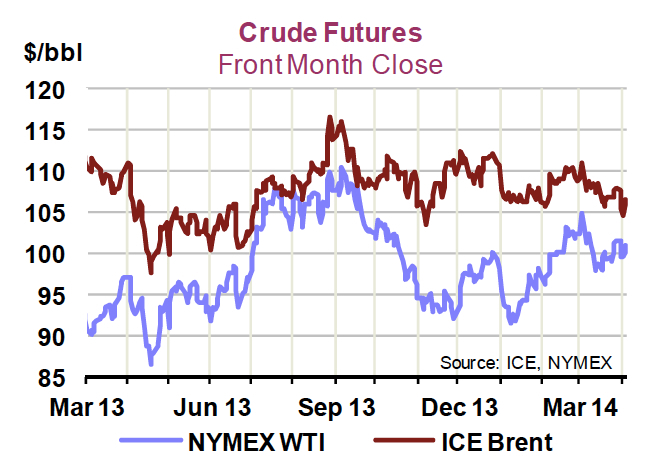 Can tight oil keep coming to market for years to come at current prices? I think not. 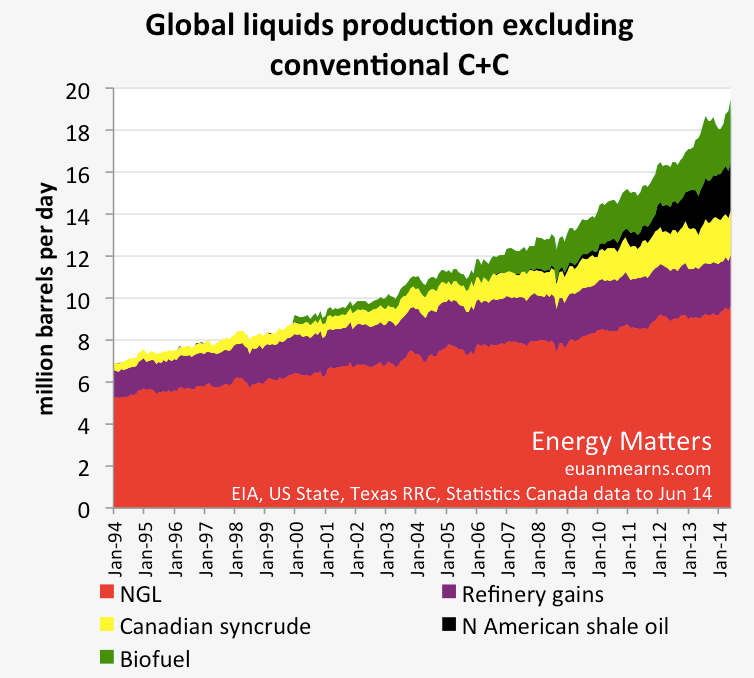 For a longer treatment of oil supply versus oil demand, see my more detailed post titled “Has Shale Killed Peak Oil“. Grantham points out that in 1940 one hour’s work for an American engaged in manufacturing could buy 20% 0f a barrel of oil. 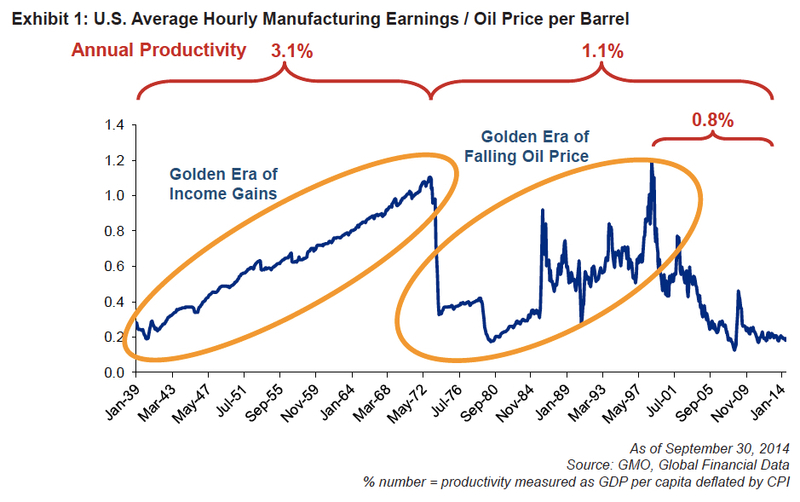 At the twin peaks of oil abundance–1972 and 1999–the same wage could buy over a barrel of oil. But those days, he argues, are long gone. According to Grantham, this has implications for not only oil markets but also for the energy underpinnings of global economic and productivity growth. Yesterday, I also argued that the rapid slowing to the Chinese economy was the likely culprit behind the havoc in commodity markets rather than a breakthrough in one particular extraction technology. As evidence, I noted how iron ore and copper prices had collapsed along with the oil price, despite the fact that you can’t frack for copper and iron ore. The critical question now is what will happen to supply in the face of sluggish demand. Tight oil production is dramatically different from traditional oil production due to the accelerated nature of the depreciation schedule. Fracked fields deplete quickly, so to maintain production you must continually invest. If you don’t, aggregate production falls fast–that is, within a year or two. So we won’t witness a decade long excess capacity work-out as you would have seen in previous oil price busts: supply should adjust to demand at breakneck speed this time around. Consequently, while we are not at “peak technology” for oil extraction, we possibly are at “peak cheap technology”. 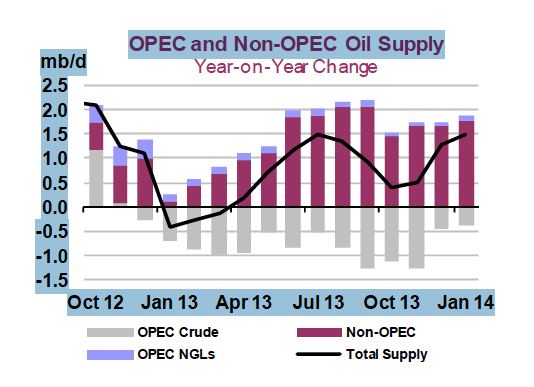 If so, forget all talk of “final blows” to peak oil. The last three months have seen a sharp drop in production growth rates from the high teens to just over 10%. It is too early to tell if this is just a temporary blip or something more permanent. Given crude oil is a globally traded commodity, U.S. production numbers need to be placed in the context of world supply and demand. 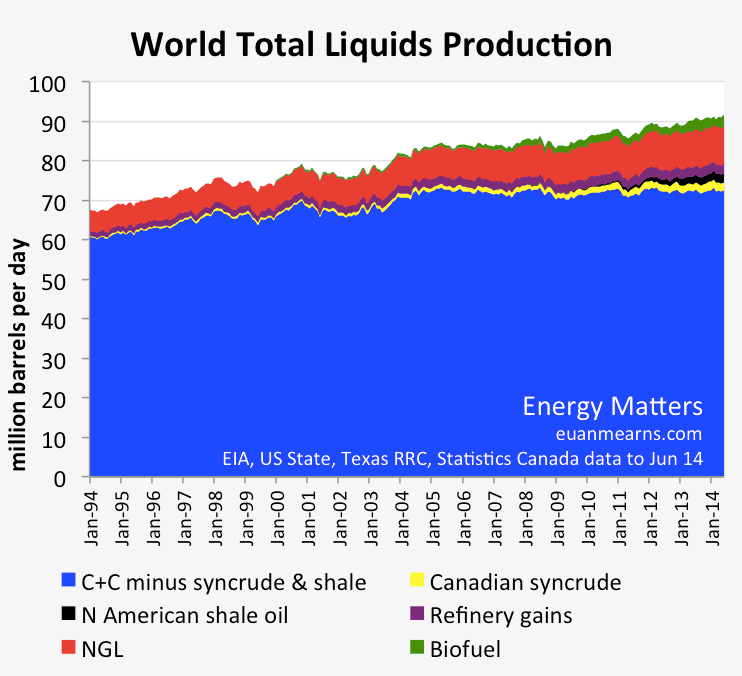 The International Energy Agency (IEA), in its latest Oil Market Report (OMR) dated 13 February 2014, recorded global ‘all liquids’ (oil and condensate) production of 92.1 million bpd for January 2014. 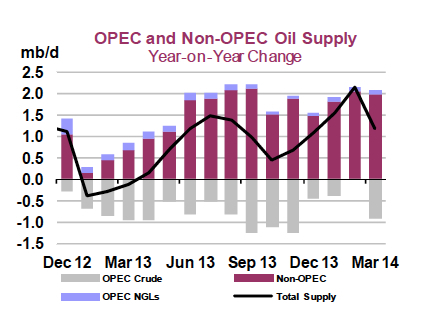 Year-on-year supply growth is averaging around 1 million bpd, or a little over 1%. In this month’s OMR, the IEA emphasises that exuberant expectations with respect to the impact of U.S. production on world supply and demand have been disappointed. Outages in Libya, disappointing production in Iraq and higher-than-expected OECD demand have more than offset increased U.S. output (click for larger image). 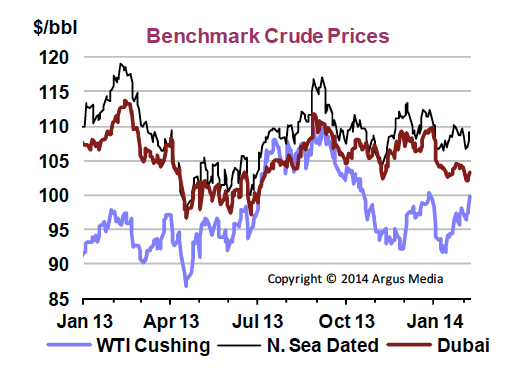 As a result, benchmark crude prices continue along an elevated plateau. Full quarterly IEA world supply-and-demand figures, including 2013 provisional supply and demand numbers, together with 2014 forecasts, can be found here. 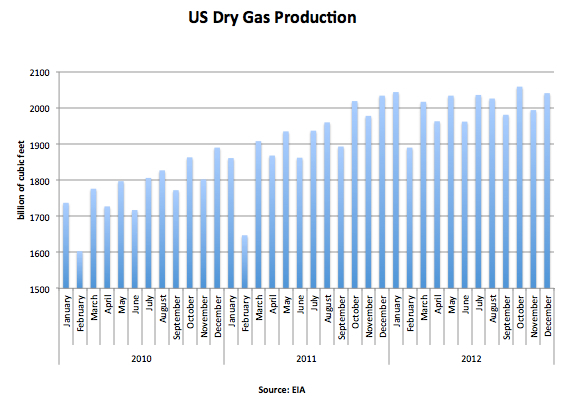 The U.S. government agency The Energy Information Administration (EIA) issues data on U.S. natural gas production, including shale gas, on a monthly basis with a lag of roughly two months. The latest data release was made on February 28 and covers the period up until December 2012. Since the end of 2011, the rate of production increase has levelled off (click chart above for larger image). Professor Jim Hamilton is one of the few economists to give peak oil considerations a proper hearing. Moreover, as one of the world’s leading econometricians and author of the popular text book “Time Series Analysis” he cannot be accused of not knowing his numbers. This last week he has posted twice on oil (here and here) on his blog Econbrowser that he co-authors with Menzie Chin. 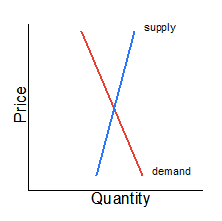 Frequently, in any discussion of resource depletion, the standard economics response is that ‘price begets supply’. Hamilton points out that such logic only extends so far for an exhaustible resource. Dana Nuccitelli has a good post at Skeptical Science entitled “A Glimpse at Our Possible Future Climate, Best to Worst“. It delves into two of the major climate risk parameters: climate sensitivity and emission paths. Other major determinants of climate risk are changes in the carbon cycle, methane release and the extent of climate-related economic impacts themselves. And that is just the ‘known knowns’ and the ‘known unknowns’. Veteran observer of the Chinese economy Michael Pettis has long argued that China’s supercharged growth rate is unsustainable. Here and here are recent restatements of his belief that we face a great re-balancing. This has major implications for both climate change-related CO2 emissions trajectories and resource depletion rates. The Washington Post asks why monetary policy no longer works and economies fail to grow around the world. Personally, I think the answer is no longer solely to be found in the study of monetary and fiscal policy. Jeremy Grantham, the ever-thoughtful Chief Investment Strategist at GMO is squarely in my camp, with his firm predicating strategy on a U.S. long-term growth rate of 1.5%. Against this background his analogy is “of the Fed beating a donkey (the 1% growing economy) for not being a horse (Bernanke’s 3% growing economy)”. Read his last GMO letter on decelerating growth and the impact on investment here. Grantham references an article by Chris Brightman of Research Affiliates which pegs long-term U.S. growth rates at 1% due to trends in population, employment and productivity. If true, and we then add in the impact of resource depletion and climate change over the next two decades (the pivot decades for me), we could easily be looking at a no-growth U.S. economy by 2030-2040.